To what extent the shift to Gov 2.0 technologies required by the latest EU strategies is changing public service delivery in practice? 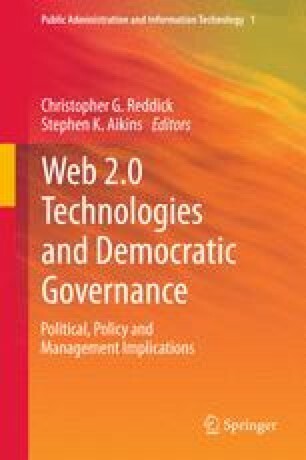 This chapter presents an overview of the consequences that Gov 2.0 technologies, embedded in European governments’ strategies, have on public service delivery at a practical stage. The research draws upon an in-depth study of the Gov 2.0 strategies of the European Union and the four major European economies, namely, Germany, France, Italy, and the United Kingdom. We aim at assessing the extent of the shift from Gov 1.0 to Gov 2.0 technologies in the declared strategies of the analyzed countries, and ascertaining alignment among declared strategies and actual practices put in place to foster public sector democracy in service delivery. Accenture. (2009). Web 2.0 and the next generation of public service. Retrieved from http://www.accenture.com. Baumgarten, J., & Chui, M. (2009). E-government 2.0. McKinsey on Government, Summer (4). Retrieved from www.mckinseyquarterly.com/E-government_20_2408. Chang, M., & Kannan, P. (2008). Leveraging Web 2.0 in government. IBM Center for the Business of Government. Retrieved from www.businessofgovernment.ort/pdfs/ChangReport2.pdf. Drapeau, M., & Wells, L. (2009). Social software and national security: An initial net assessment. Center for Technology and National Security Policy, National Defense University. Retrieved from http://www.ndu.edu/ctnsp/Def_Tech/DTP61. French eGovernment Factsheets, Ed. 10.0, 13.1, 14.0, from June 2008 to January 2011. Retrieved from www.epractice.eu/en/factsheets. French eInclusion Factsheets, Ed. 1.0, October 2010. Retrieved from www.epractice.eu/en/factsheets. German eGovernment Factsheets, Ed. 10.0, 13.0, 14.0, from July 2008 to January 2011. Retrieved from www.epractice.eu/en/factsheets. German eInclusion Factsheets, Ed. 2.0, October 2010. Retrieved from www.epractice.eu/en/factsheets. Italian eGovernment Factsheets, Ed. 9.1, 13.1, 14.0, from June 2008 to March 2011. Retrieved from www.epractice.eu/en/factsheets. Italian eInclusion Factsheets, Ed. 2.0, April 2010. Retrieved from www.epractice.eu/en/factsheets. McKinsey Global Survey Results. (2008). Building the Web 2.0 enterprise. Retrieved from http://McKinseyquarterly.com. UK eGovernment Factsheets, Ed. 10.0, 13.0, 14.0, from October 2008 to July 2010 (retrieved from www.epractice.eu/en/factsheets). UK eInclusion Factsheets, Ed. 2.0, July 2010 (retrieved from www.epractice.eu/en/factsheets).